Myzus ascalonicus apterae are shiny brownish green to dirty yellow (cf. Myzus cymbalariae which are not shiny). The antennal tubercles have their inner faces approximately parallel in dorsal view (cf. Myzus cymbalariae and Myzus persicae which have the inner faces convergent). Their legs and antennae are pale, apart from the ends of the antennae and the tarsi. The dorsum is strongly convex in comparison with related species (best seen in the first micrograph below). The siphunculi are shorter than antennal segment III, distinctly swollen towards the apex, evenly coloured throughout and with only a very small flange (cf. Myzus persicae which has siphunculi longer than antennal segment III and dark-tipped). The siphunculi have their narrowest part thinner than, or equal in width to, the hind tibia at midlength ( (cf. Myzus cymbalariae which has the narrowest part of the stem slightly thicker than the hind tibia at midlength). The cauda is roughly triangular in shape, and short: about one third the length of the siphunculi. 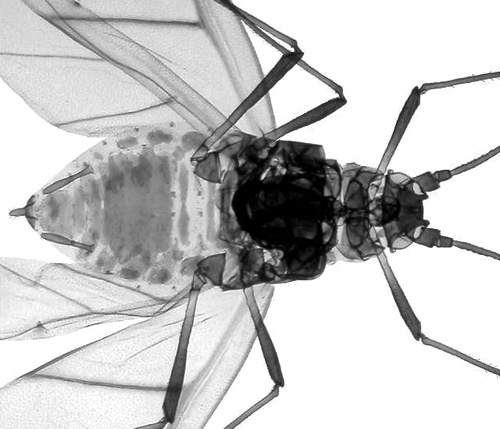 The body length of Myzus ascalonicus apterae is 1.1-2.2 mm. The alate Myzus ascalonicus (see second picture above, and second micrograph below) has a large central dark patch extending over at least the central areas of abdominal tergites 3-6 or 4-6 (cf. the alate Myzus cymbalariae which has the dorsal abdominal sclerotization at least partly divided into separate segmental cross bands). The images below show an apterous and an alate Myzus ascalonicus in alcohol. 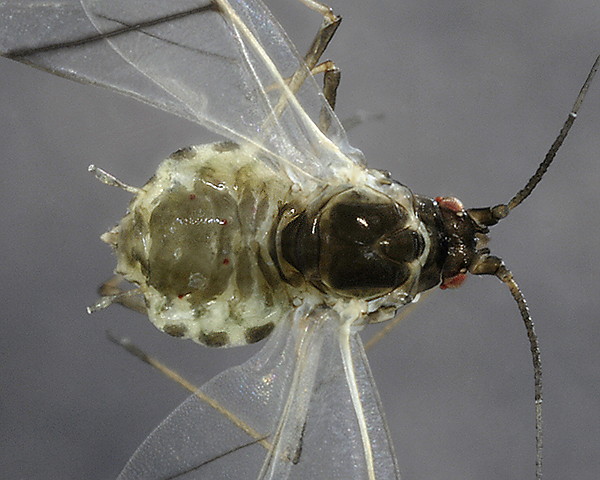 The clarified slide mounts below are of adult viviparous female Myzus ascalonicus : wingless, and winged. Micrographs of clarified mounts by permission of Roger Blackman, copyright AWP all rights reserved. 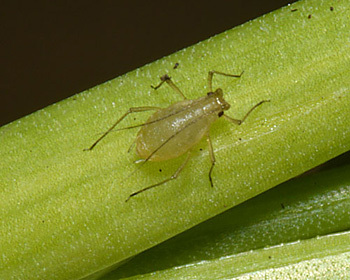 The shallot aphid does not host alternate, but is extremely polyphagous feeding on crops such as onions, shallots, strawberries, lettuce, brassicas and potatoes and many garden ornamentals. There is no sexual stage in the life cycle and no eggs are produced. Instead Myzus ascalonicus is cold-hardy, and overwinters in glasshouses and sheltered areas. Numbers may build up even at low temperatures in winter and spring, with alates migrating to other crops up to mid-June. Myzus ascalonicus overwinters parthenogenetically on range of weeds such as chickweeds (Stellaria) and speedwells (Veronica). The picture below shows an apterous adult on Veronica in mid March. Myzus ascalonicus has been recorded on 6 Stellaria species (Stellaria graminea, Stellaria holostea, Stellaria media, Stellaria monosperma, Stellaria neglecta, Stellaria nemorum). Blackman & Eastop list 19 species of aphid as feeding on chickweed (Stellaria media) worldwide, and provide formal identification keys. Of those aphid species, Baker (2015) lists 17 as occurring in Britain: Acyrthosiphon auctum, Aphis craccivora, Aphis fabae, Aphis gossypii, Aphis nasturtii, Aphis sambuci, Aulacorthum solani, Brachycaudus helichrysi, Macrosiphum euphorbiae, Myzus ascalonicus, Myzus certus, Myzus cymbalariae, Myzus ornatus, Myzus persicae, Neomyzus circumflexus, Rhopalosiphoninus latysiphon and Rhopalosiphum rufiabdominale. Myzus ascalonicus has been recorded on 10 species within the Veronica genus. Blackman & Eastop list 11 species of aphid as feeding on speedwell (Veronica beccabunga) worldwide, and provide formal identification keys. 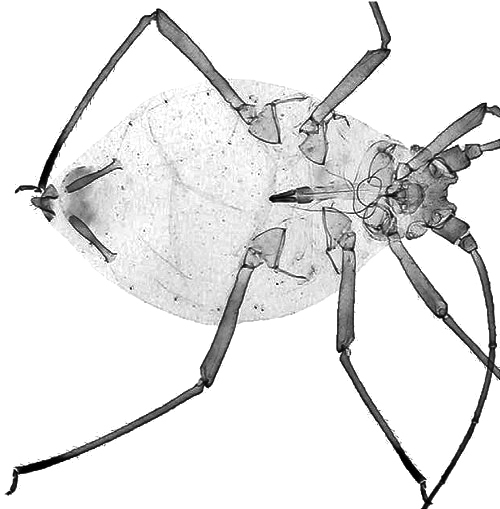 Of those aphid species, Baker (2015) lists all 11 as occurring in Britain: Aphis frangulae beccabungae, Aphis nasturtii, Aphis triglochinis, Aulacorthum solani, Brachycaudus helichrysi, Cryptomyzus galeopsidis, Myzus ascalonicus, Myzus cerasi, Myzus ornatus, Myzus persicae, and Nasonovia ribisnigri. Myzus ascalonicus has been recorded on 8 species within the Allium genus (Allium ampeloprasum, Allium ascalonicum, Allium cepa, Allium fistulosum, Allium sativum, Allium schoenoprasum, Allium scorodoprasum, Allium ursinum). 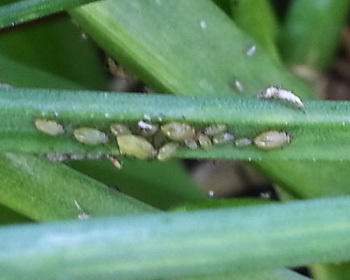 Blackman & Eastop list 9 species of aphid as feeding on onions &/or shallots (Allium cepa =Allium ascalonicum) worldwide, and provide formal identification keys. 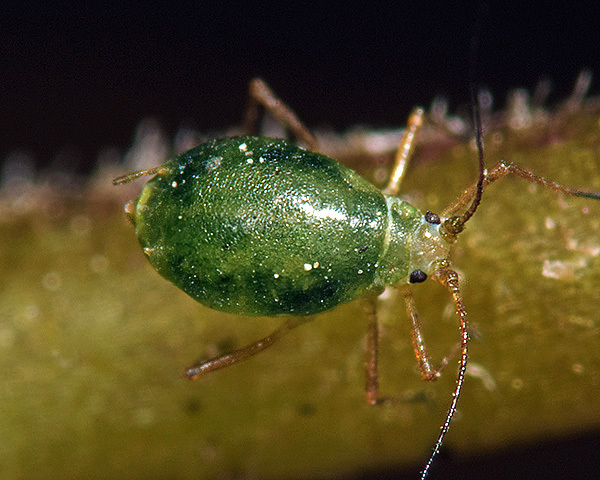 Of those aphid species, Baker (2015) lists 8 as occurring in Britain: Aphis fabae, Aphis gossypii, Myzus ascalonicus, Myzus cymbalariae, Myzus persicae, Neotoxoptera formosana, Rhopalosiphum padi, and Rhopalosiphum rufiabdominale. Myzus ascalonicus has been recorded on 3 species within the Fragaria genus (Fragaria × ananassa, Fragaria vesca, Fragaria ×viridis). Blackman & Eastop list 28 species of aphid as feeding on garden strawberry (Fragaria × ananassa) worldwide, and provide formal identification keys. 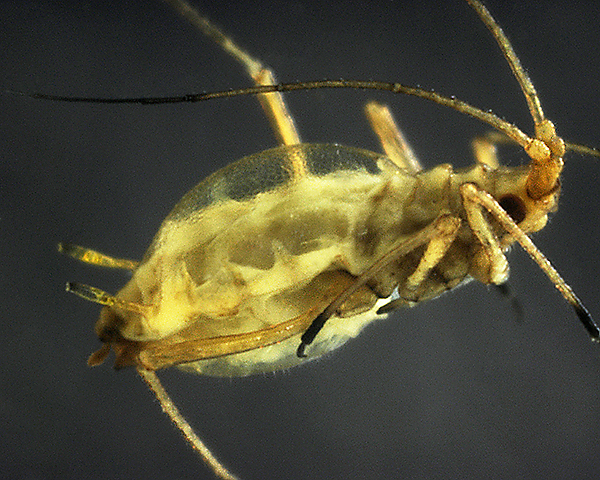 Of those aphid species, Baker (2015) lists 19 as occurring in Britain: Acyrthosiphon malvae ssp. rogersii, Amphorophora rubi, Aphis fabae, Aphis gossypii, Aphis ruborum, Aphis spiraecola, Aulacorthum solani, Brachycaudus helichrysi, Chaetosiphon fragaefolii, Ericaphis wakibae, Macrosiphum euphorbiae, Macrosiphum rosae, Myzaphis rosarum, Myzus ascalonicus, Myzus ornatus, Myzus persicae, Neomyzus circumflexus, Sitobion fragariae and Smynthurodes betae. Myzus ascalonicus has been recorded on 1 species within the Lactuca genus: Lactuca sativa. Blackman & Eastop list 28 species of aphid as feeding on lettuce (Lactuca sativa) worldwide, and provide formal identification keys. 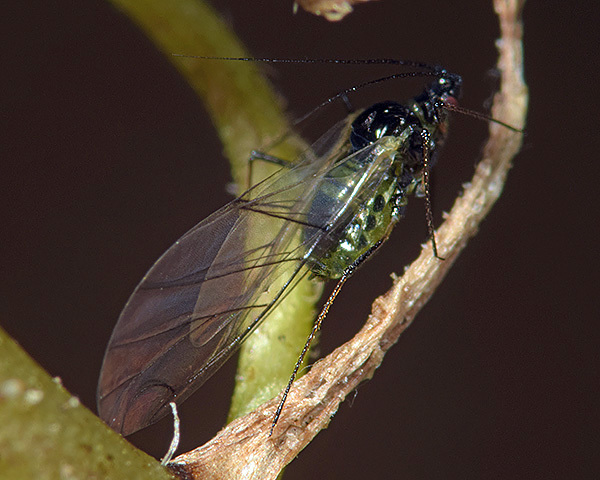 Of those aphid species, Baker (2015) lists 21 as occurring in Britain: Acyrthosiphon lactucae, Aphis fabae, Aphis gossypii, Aphis spiraecola, Aulacorthum solani, Brachycaudus helichrysi, Hyperomyzus lactucae, Macrosiphum euphorbiae, Myzus ascalonicus, Myzus cymbalariae, Myzus ornatus, Myzus persicae, Nasonovia ribisnigri, Neomyzus circumflexus, Pemphigus bursarius, Protaphis terricola, Trama caudata, Trama troglodytes, Uroleucon cichorii, Uroleucon picridis and Uroleucon sonchi. Myzus ascalonicus has been recorded on 2 species within the genus Brassica (Brassica napus, Brassica oleracea). Blackman & Eastop list 25 species of aphid as feeding on Brassica species worldwide, and provide formal identification keys. Of those aphid species, Baker (2015) lists 21 as occurring in Britain: Aphis craccivora, Aphis fabae, Aphis gossypii, Aphis nasturtii, Aphis spiraecola, Aphis triglochinis, Aulacorthum solani, Brachycaudus helichrysi, Brevicoryne brassicae, Lipaphis erysimi, Lipaphis pseudobrassicae, Macrosiphum euphorbiae, Myzus antirrhinii, Myzus ascalonicus, Myzus ornatus, Myzus persicae, Nearctaphis bakeri, Pemphigus populitransversus, Pseudobrevicoryne buhri, Rhopalosiphoninus latysiphon, Rhopalosiphoninus staphylea and Smynthurodes betae. Myzus ascalonicus has been recorded on 1 species within the Solanum genus: Solanum tuberosum. Blackman & Eastop list 23 species of aphid as feeding on potato (Solanum tuberosum) worldwide, and provide formal identification keys. Of those aphid species, Baker (2015) lists perhaps 21 as occurring in Britain: Acyrthosiphon malvae, Aphis craccivora, Aphis fabae, Aphis frangulae, Aphis frangulae beccabungae, Aphis gossypii, Aphis nasturtii, Aphis solanella, Aphis spiraecola, Aulacorthum solani, Brachycaudus helichrysi, Macrosiphum euphorbiae, Myzus antirrhinii, Myzus ascalonicus, Myzus ornatus, Myzus persicae, Neomyzus circumflexus, Pemphigus sp., Rhopalosiphoninus latysiphon, Rhopalosiphum rufiabdominale and Smynthurodes betae. Our particular thanks to Roger Blackman for images of his clarified slide mounts. Alexandra Shaw, March 09, 2014, ID? Thought of you as I got this plant out of the conservatory earlier today. Image copyright Alexandra Shaw, all rights reserved. Thanks for the photo -- they do seem to be doing rather well. 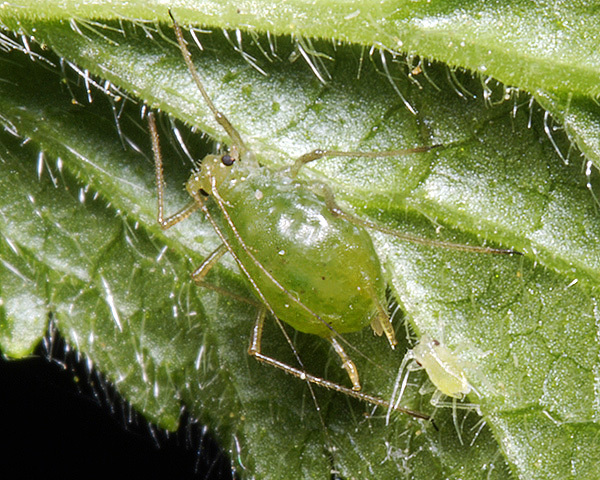 Sadly, unlike birds, we can rarely ID aphids from a photo - even if it is up-close and personal. 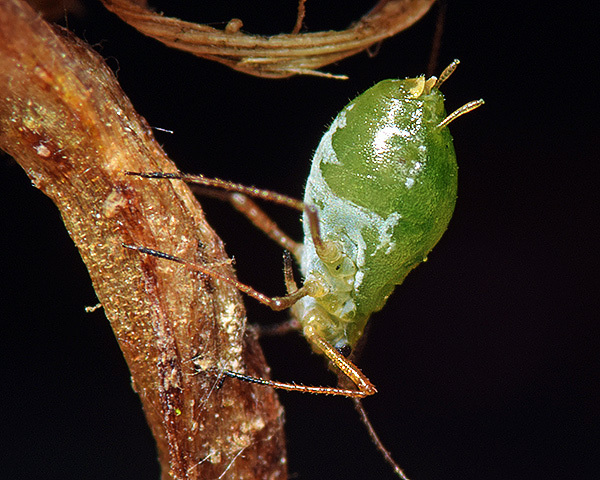 There are at least 600 aphid species in UK (many of which are fairly plant specific). Do you know what plant they were on? Could you send us a live sample in a small plastic box?? If you have nothing better to do for an afternoon we have some pages on finding and identifying aphids. Do you really want me to send you some? I'm happy to do so. I've put the plant, a bulb of sorts [probably wild hyacinth], outside from the conservatory so they may have given up in the cold. Many thanks for sending us the beasties. [Examining the sample, thus far we have only] found "fourth-instar alates" (they have developing wing-buds). Given which the rest of the ravening hoard you found has probably matured to adult alates - and flapped-off. As you may have gathered we are trying to raise a few to (wingless) adults so we can identify them. Given the siphunculi are clearly swollen and the aphids are brownish green, these are probably Myzus ascalonicus, but only immatures were present - which we were unable to raise through to adults.